PASADENA, Calif. -- Mexico are the kings of CONCACAF. El Tri defeated the U.S. 3-2 in extra time in front of a capacity crowd of 93,723 at the Rose Bowl; as a result, Mexico claims CONCACAF's berth in the 2017 Confederations Cup. Mexico's Chicharito Hernandez and U.S. defender Geoff Cameron traded goals five minutes apart in the first half as things ended 1-1 after 90 minutes. Oribe Peralta scored in the sixth minute of extra time to give Mexico the lead, but the U.S. responded with a goal in the 108th minute from sub Bobby Wood, which only set the stage for Paul Aguilar's game winner two minutes from time to give Mexico an epic victory. Paul Aguilar's stunning goal gave Mexico a deserved victory over the U.S. in their CONCACAF Cup clash. Here are three thoughts from an enthralling contest. The opening exchanges of this match hinted at a wide-open affair reminiscent of the 2011 Gold Cup final. Chicharito finished off a flowing move in the 10th minute, tapping home Peralta's pass with the U.S. defense completely bent out of shape. But the Americans responded quickly with Cameron heading home Michael Bradley's exquisite free kick just five minutes later. The pace of the game was relentless for much of the first half, and the U.S. created some dangerous moments through the prodding of Bradley. But as the match progressed, it looked like so many U.S.-Mexico matches of the past. El Tri controlled most of the play but struggled to find a breakthrough thanks to some tough defending and solid goalkeeping from Brad Guzan. Meanwhile, the US were left to rely on counterattacks. The Americans also benefited from some good fortune when an apparent handball late in the second half by Matt Besler went unsanctioned. There have been plenty of times when this had proved to be a winning formula for the U.S., but this was one night in which Mexico's pressure ultimately paid off. A clever ball over from Hector Herrera found Aguilar in space, and his cutback was too much for a scrambling U.S. defense to deal with, and Peralta fired home seven yards for what appeared to be the winner. The Americans' never-say-die attitude came to the forefront once again, however. Out of nothing, substitute DeAndre Yedlin surged forward, and his penetrating pass into the box was one-timed home by fellow substitute Wood to give the U.S. life in the 108th minute. That only set the stage for a decisive goal worthy for any final. A Mexico free kick was cleared only as far as Miguel Layun, who touched the ball toward Raul Jimenez with a hopeful pass. Jimenez then delivered an overhead kick that looped right into the path of Aguilar, who blasted his first-time shot past Guzan inside the far post. 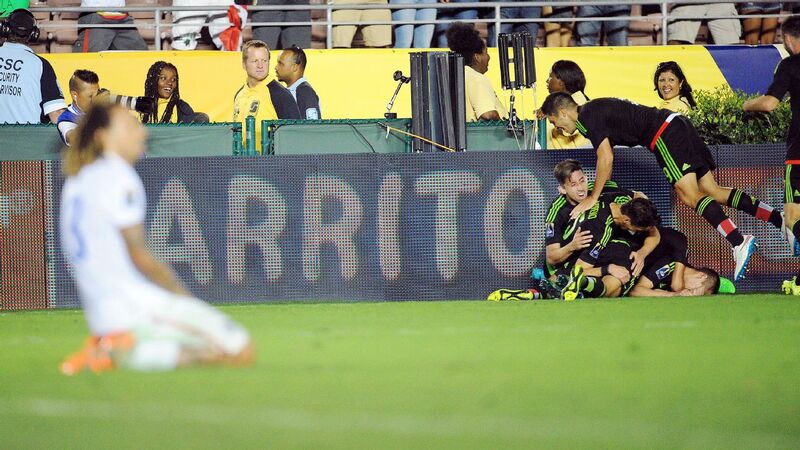 Chicharito scored his first goal against the Americans early in the first half as Mexico thrived with three forwards. With holding midfielder Jose Juan Vasquez out due to injury, Mexico interim manager Tuca Ferretti was forced to dig deep into his tactical bag. His solution was to deploy his team in a 4-3-3 with Rafa Marquez playing in a holding midfield role that often saw him drop into defense as well. But what really caused the U.S. problems was Mexico's forward trio of Jimenez, Chicharito Hernandez and Peralta. The movement of the three forwards caused plenty of confusion in the center of the U.S. defense in terms of who to mark, and when two of the three dropped deeper into midfield, it left Kyle Beckerman often having to decide who to mark as well. This forced Michael Bradley to drop a bit deeper in an effort to provide defensive help. The opening Mexico goal was a perfect illustration of the formation's strengths. Aguilar's pass was dummied by Peralta into Jimenez, whose return feed left Peralta in all kinds of space. With the U.S. scrambling to recover, Peralta's square pass found Hernandez wide open to tap the ball home. Brad Guzan was strong in goal, standing up to Oribe Peralta after a first-half collision, but it couldn't prevent defeat. But every alignment has its weaknesses; Ferretti's approach was no different. In the early moments, Marquez was deployed just in front of the backline but dropped deeper and deeper into defense as the match progressed, giving Mexico more of a 3-4-3 look. This gave Bradley space to exploit when he moved forward, and the U.S. captain had a glorious look at goal in the 32nd minute after a slick buildup involving Dempsey and Fabian Johnson. Credit must go to the U.S. defense, who survived the early wobbles to deliver its best performance in some time. Granted, it helped that there was considerably more experience in this group than there has been for much of the year, Cameron in particular growing into the game. Yet the quality of Jimemez, Peralta and Hernandez proved to be too much for the U.S., and Ferretti can walk off into the sunset as a hero as Juan Carlos Osorio takes over. 3. U.S. regains identity but is that enough? Much of the run-up centered on the amount of pressure that Klinsmann faced regarding the result. While 2015 has been notable for friendly wins over powerhouses Germany and the Netherlands, the Americans' failure at the Gold Cup has loomed larger. The sight of the U.S. U-23 team falling in the semis of the Olympic-qualifying tournament earlier on Saturday heaped more skepticism on his tenure, though it should be noted that all is not lost for the Olympic team -- they can still qualify if they finish third and prevail in a one-game playoff against Colombia next March. That's not say there was ever any danger of Klinsmann being fired. Only a catastrophic run of results in World Cup qualifying would even raise the possibility of his dismissal. As for this match, whether the pressure on Klinsmann is increasing or decreasing is open to interpretation. In many respects, the U.S. played its best game in months with the grit and fight that has long been the team's trademark. And if their best chance of winning is with a defend-and-counter strategy, so be it. But once again we are left with the same question the U.S. was asking themselves 15 months ago after defeat vs. Belgium in the World Cup: Is this progress? In the context of the past three months, the U.S. looked better on this night, but in this overall World Cup cycle, the answer is no.